One thing Jason and I noticed right off the bat when we moved to San Antonio, is that there are a ton of stray animals. We think this is probably because of the warm climate, but also may be a lack of awareness regarding spaying and neutering. Anyway, it is really heart-wrenching for us to see all these homeless pets on a regular basis, and I knew this would eventually get us in trouble. I had a horrible experience witnessing a little kitten scrambling across a 6 lane highway a couple of weeks ago. That's right- A kitten on the highway- with cars zooming by at 65 MPH! I saw he made it to the shoulder. When I circled back around I said to myself, that if I see that kitten again- he's mine. Didn't see him and decided it's best not to get out of my car on the highway. Last night Jason and I, and our neighborhood friend Heather were walking down our street on the way to the Alta Vista neighborhood Meet and Greet, when Heather pointed out a stray kitty that was laying in front of a house. This little guy was particularly pathetic- and seeing as all 3 of us have soft spots when it comes to cats, we just couldn't leave him there. I mean, come on, it's a kitten, it needs no further explanation. So we went back to our house with the kitten and put him in the guest house. He ate tuna and used the litter box- good sign! 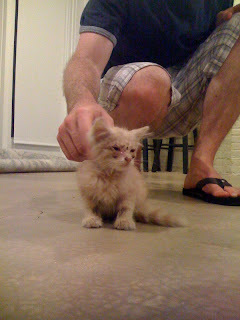 He's just skin and bones right now, and has an eye infection. I took him to our vet this morning to get him checked out, he's going to be much cuter once he's a little more healthy. Since our household has already met it's pet quota, and our Tweed seems to be accustomed to her 1 kitty in the house life-style (we don't want to upset the delicate balance). We're going to try and find him a happy home once he's been given the "thumbs-up" from our vet. In other news- Jason and I are celebrating our 30th birthdays this week. And we're taking a vacation to California (San Francisco and L.A. and the coast in-between) to celebrate. This trip was planned around Slicehoster friend Jared's wedding in Livermore, CA on July 1st. We also get to visit cousin Brad and partner Jim in L.A., and Rackspace friend Adrian in L.A. Mom's 1st visit to San Antonio came and went. We accomplished our main mission- finding a "MOG" (mother of the groom) dress for my brother Joe's wedding, which is less than an month away. We took lots of shopping detours on the way and bought a few other fun things too. Mom and I had lots of fun on our pizza making day, which involved purchasing special mail-order pizza-dough-making flour a week prior to the visit. The pizza was quite tasty, but I think I might hold off on baking pizzas from scratch again until the heat of summer is over. We went out on the town a couple of nights, and she got to meet some of our fabulous San Antonio friends. Mom found her new vacation home to be cozy and cool, so I think she'll be back! Here we are down at the Farmer's Market, checking out the brand-new Riverwalk extension. The Carriage House is complete- and we had a party! As of last Friday the Carriage House is officially completed! We pasted the final inspections. So, Jason and I decided to have a big party and invited all our San Antonio friends. 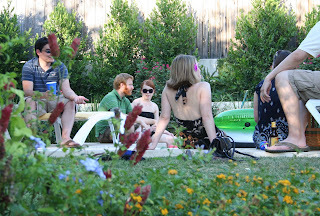 We had a mixture of Rackspace friends, and non-Rackspace friends, and the party was a raging success. Jason and I managed to make 60 hamburger patties from scratch the night before, and Jason manned the grill on Saturday. I think we had between 50 and 60 people- and the party lasted from 2 pm till 2 am. So our Carriage house is officially broken-in. A link to the final pictures and party pics will be posted soon! Next projects: Phase 2 - The Shed and Amanda's Quest to make this old house more energy efficient. The Carriage House will have it's first sleep-over guest as of tonight! My mom is on her way to San Antonio for the first time. We plan on shopping and cooking together, and other girly things. Sometimes you can find just the two of them serenading at the local pubs and restaurants in town. But what will really rock your socks off is the complete band with AJ on drums, Matt on base, and new addition- Nicholette on mandoline and back-up vocals. Be prepared for impromtu dancing at these gigs.